There’s something near-mystical about the great outdoors, and nature and wildlife enthusiasts will all agree that nothing brings peace to mind like a quiet getaway with Mother Nature. What is more exciting is that today’s outdoor adventurers have the luxury of conveniently bringing different helpful products. 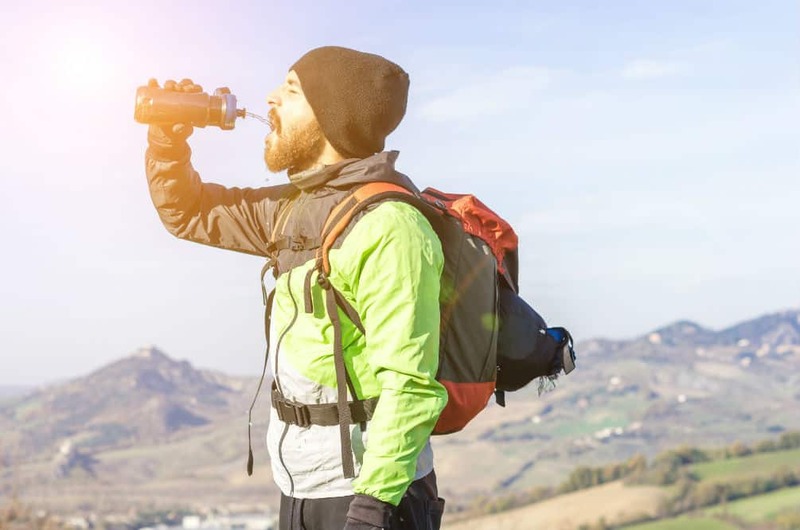 In fact, stocking water for outdoor trips isn’t a prerequisite anymore because the market is filled with some of the best water filtration system for backpacking. Having a filtration system will make room for more luggage which translates into a more extended stay. 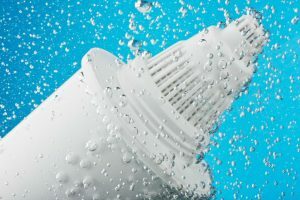 Apart from saving space, during longer stays, water filters have the benefit of providing users with clean, fresh-tasting water, which is opposite to stale, bottled water. Overall, a portable water filtration system is a perfect investment for the avid outdoor enthusiast, giving him or her more freedom of exploring the gift of nature. However, why is it essential for hikers and outdoor enthusiasts in general to find the best water filtration system? Well, the outdoors, as beautiful as they are, can become an unforgiving place. A trip can quickly turn sour, leaving the participants in a struggle for life and death. In these moments, it’s essential that the present gear will work as intended. 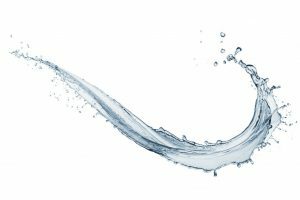 If that gave you excitement or if you are about to purchase a water filter for your adventures, have a look at the three products that we have evaluated below for you to find out which one will work for you best. The Sawyer Products Mini Water Filtration System is a top-shelf item for the average hiker. In a compact form, this water filter conveniently delivers fresh water. 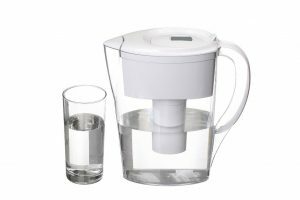 Designed and fitted with a great filtration system, this two-ounce wonder brings the convenience and freshness of filtered water to the mountain peaks. Fitting comfortably in any hiking bag or backpack, the MINI comes in a great kit: a straw for easy consumption, a plunger for convenient cleaning, and a squeeze bag for storing water on the go. In addition, the filter has a good selection of attachments that allow the user to install the device on different spouted recipients. This USA-made filtration system traps both living and chemical components of wild water because of its 0.1-micron sized filter. This is important since a lot of portable filters that are currently available on the market will only filter chemicals, leaving the user exposed to bacteria and viruses. That being said, a very small percentage of filters have a fault, causing them to leak. In that case, the company does provide replacements to customers living in certain areas, so just make sure to check the policy before making the purchase. 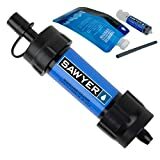 Other than this small fault, the Sawyer Products Mini Water Filtration System is a truly impressive portable water filter. 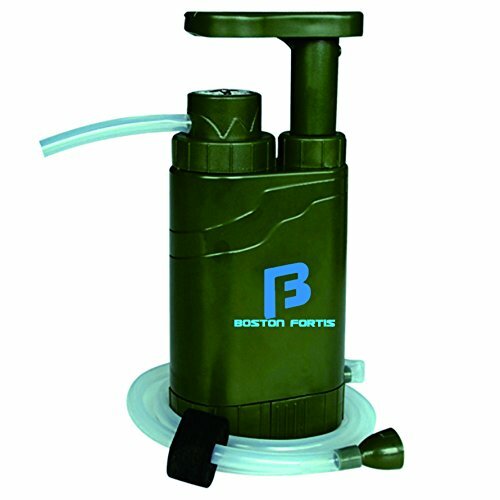 The Survivor Filter Virus Tested Portable Water Filter is a product has a rugged outdoor look, a potent triple filtration system, and sturdy construction. Hence, this portable lifesaver can be a last-resort in a terrible situation. Its plastic connector can be threaded onto regular bottles or to the two canteens that can be optionally purchased if you want a full survival kit. The canteens are foldable since they’re more of a water bag than a bottle. In addition, they can fit snugly in any backpack, giving the user plenty of room for other survival essentials. The mouthpiece is made using carbon, which is more durable and reliable than the plastic type. 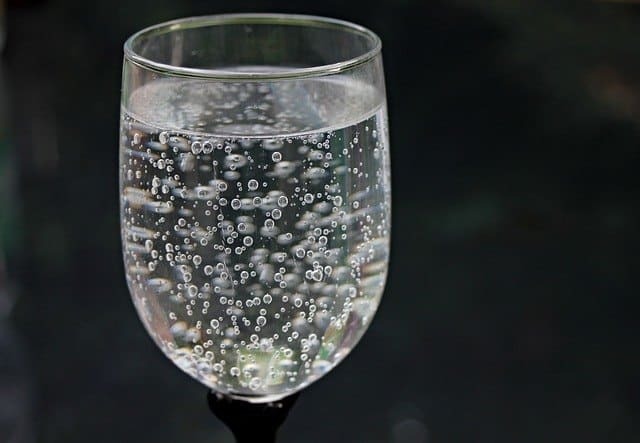 All in all, the Survival Filter Portable Water Filter could benefit from some improvements, such as adding a carbon fiber connector. That being said, it’s still one of the best water filtration systems for backpacking. 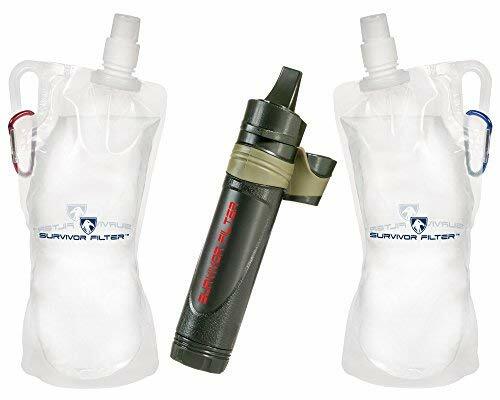 Survivor Filter Squeeze - Virus Tested Portable Emergency Water Filter with 2 Attachable (33oz) Canteens (2L Total). 3 Stage – Carbon, Re-Usable 100,000L UF Membrane and 6 Cotton Pre-Filters. 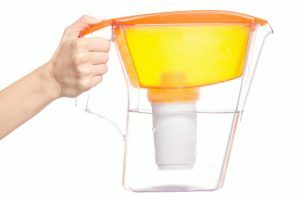 GRAVITY OR SQUEEZE BOTTLE SYSTEM: The Survivor Filter Squeeze System allows you to fill up the included canteens and screw into your devices to use as a gravity or squeeze bottle system. The squeeze cleans water down to a filtration level of 0.05 microns. THE WORLD-RENOWNED SURVIVOR FILTER IS USE TESTED: Tested at multiple labs in the USA to show 99.999% filtration removal for tested virus (Phi-X 174), staph, parasites and bacteria. The Survivor Filter has the highest filtration efficiency on the market and is the only straw with legitimate USA testing to back up our claims! 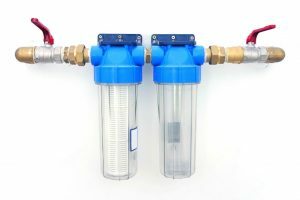 THE ONLY FILTER THAT CAN BE TAKEN APART AND THE COMPONENTS CLEANED AND REPLACED: Membrane ultra filter lasts up to 100,000 liters (26,417 Gallons), replaceable carbon filter lasts up to 1,000 liters (264 Gallons) as do the cotton pre-filters. Plus 5 extra cotton pre-filters are included! TRIPLE FILTRATION: Consisting of ultra membrane filter, carbon filter and mesh cotton pre-filter plus comes with 4 extra mesh filters cotton pre-filters! 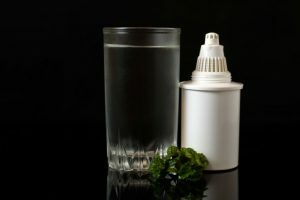 Other personal water filters are difficult to drink from, the Survivor Filter Personal Water Filter has a special mouthpiece, an integrated cap to keep the mouthpiece clean and produces a super-fast flow rate of 200 ml. (7 ounces) per minute. SURVIVOR FILTER LIFETIME WARRANTY: Survivor Filter is based in North America and we cover all manufacturing and other defects with our Lifetime Warranty. If you ever run into any problems with any of our products simply contact us and we will work to make it right. The Boston Fortis Explorer Portable Water Filter has a bit of an interesting approach. Instead of taking the ultralight model that’s currently taking over the outdoor market, Boston Fortis have opted for a slightly bigger pump model. 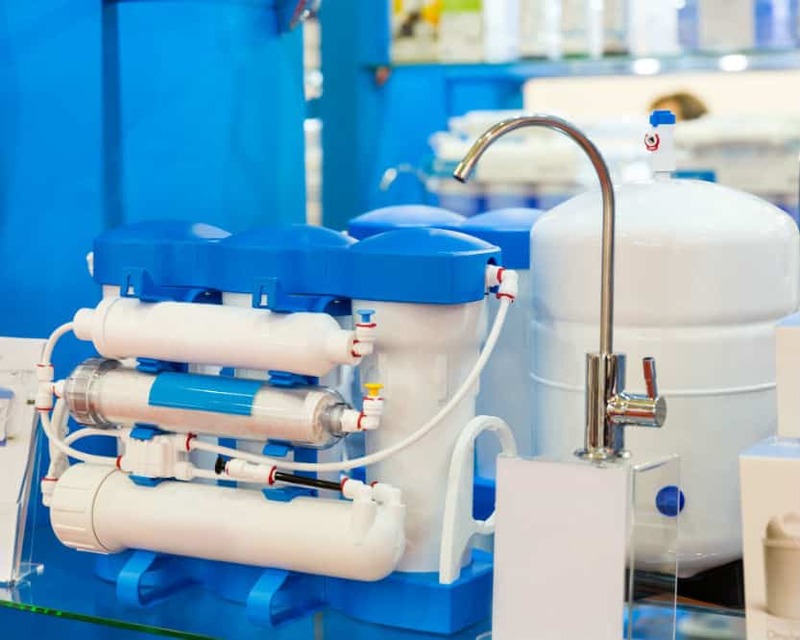 As opposed to having a water supply attached to the filter, it has a tubing system which allows it to extract water from a natural source (streams or lakes) and pump it into a container. Design-wise, it looks like a run-of-the-mill piece of survival gear since it’s fitted with other accessories, such as a flashlight, compass, fire starter and even a mini knife. That being said, the quality of these “add-ons” is questionable. The filter itself suffers from a fatal fault. It pumps water twice as slow than other contenders. Also, it clogs quickly, something that can’t be tolerated in the outdoors. Nonetheless, this product is equipped with three modern filtration systems namely: ceramic, carbon, and KDF. As such, its 0.1-micron filtration capability can prevent the consumption of most bacteria, chemicals, and minerals. 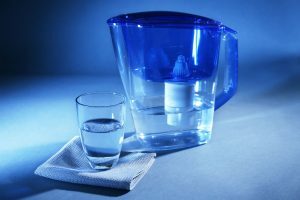 From the information given above, we think that it’s not so hard to determine what the best water filtration system for backpacking is. In this case, for us, the Survivor Filter Virus Portable Water Filter is the one that brings home the bacon. It’s effortless to dismantle and put back together as well as has a durable construction. Likewise, it stays consistent with its performance, which is the most critical factor. In addition, it’s also very pleasant looking, highly portable and easy to use.